Back in April, I purchased the Stone House Runner from The Old Tattered Flag. 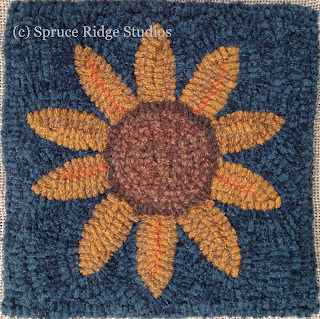 I was inspired to hook it after teaching in January at the Off The Ocean Rug School in Jackson, FL. One of my students chose it for her class pattern and I helped color plan it. I loved the way her runner was looking so I decided to use the same color plan for myself. The Stone House Runner is a whopping 7 feet long by 2 feet wide. I don't think I have ever hooked anything quite that big before. I'm using #9 cuts for the background, and #8.5 for a lot of the other motifs, with an occasional #8 cut where I needed a thinner line or smaller detail. I purchased the runner on April 14th and here is my progress on April 22nd. I think the motif I enjoyed hooking the most was the gigantic tulip. I didn't really have to outline the star but I like the way the outline sort of "dresses" it up a bit. This is my progress on May 17th. I started working on the "bridges" that run along the sides. Lots of triangles! I think I am an triangle expert now. On June 26th, I was starting the other side of the "bridges." I was going to hook the center motif in gold but after working on it for a little bit, I decided that red was a better choice...the gold just wasn't making me happy. My progress on July 6th. I am really a triangle expert now! And maybe a little circle expert too. I'm ready to move on to the other end. Here is the way the rug looked on August 13th. I've got one corner to go! And of course, the large tulip. I think I'm saving that for last because the other one was so much fun, and why not save the best for last? Sauder Village and Michigan Fiber Festival were soon to follow after August 13th, so I haven't done too much more hooking but I look forward to getting back to my old friend. I think I'll have separation anxiety when it is completed. It's been a nice companion all summer long. Oh, and besides working on this runner, I have hooked 3 small projects and one medium sized rug in between. Do I hook all summer? You betcha! Just put a fan in front of me and a cold drink and I'm good to go! Here is a rug that I recently finished hooking. It's adapted from a design by Johanna Parker. 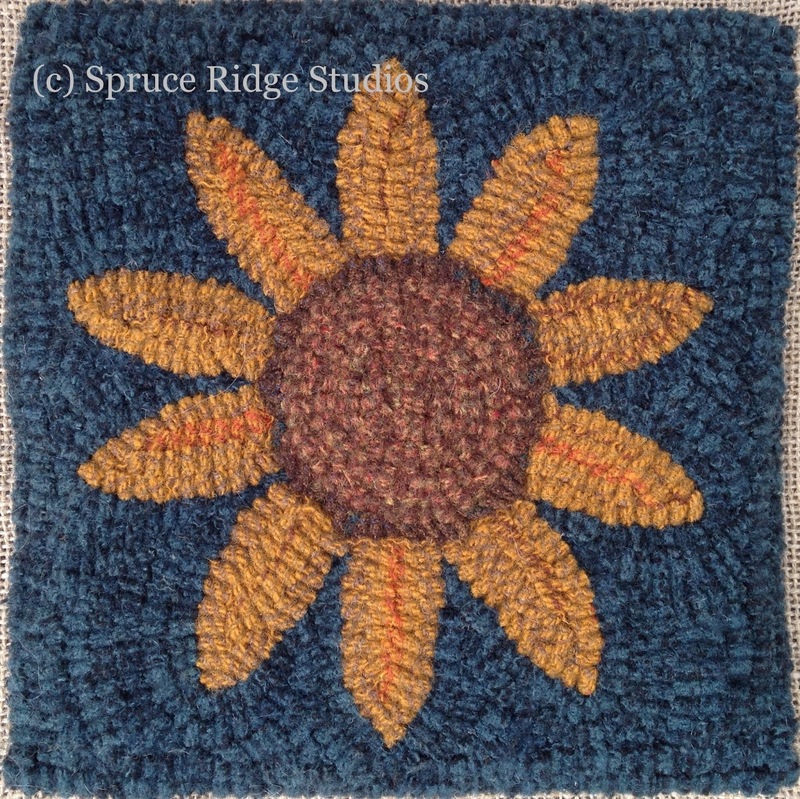 I have recently added Johanna as an artist to the Spruce Ridge Studios roster of designers. She is known for her whimsical Holiday designs but she drew up some perky florals for me too. I started this at the end of April when I was traveling. I had 3 nights in a hotel room all to myself. 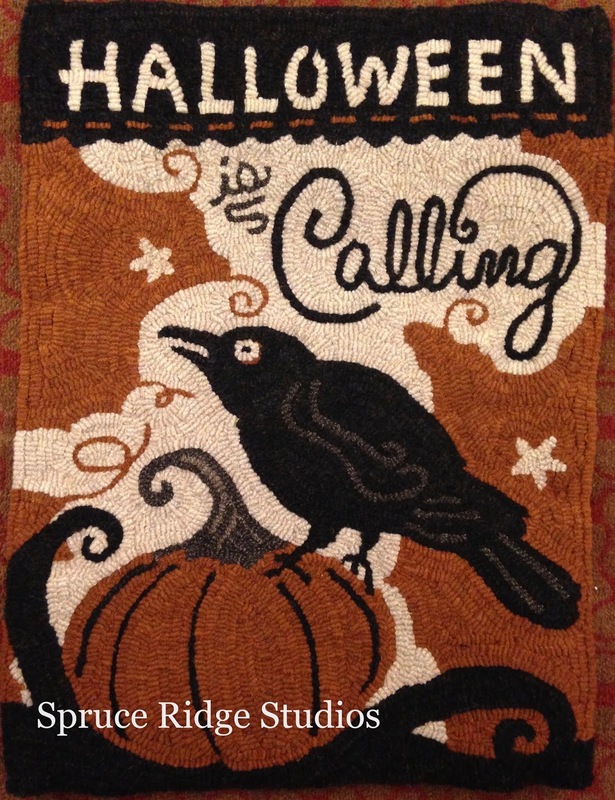 It felt like I was on a rug hooking vacation! Just me, my cutter, hook, and frame...I spent my time hooking away to my heart's content. The nice thing about this pattern is that you only need 4 colors so I concentrated mostly on the direction I was hooking to give shape to the objects. I saved the lettering for last. I don't know why because usually I tackle the harder things first but I am quite happy with the way they came out. I love the vintage poster feeling of this design. I have had many people ask me what cut I used and I have to say, I always use a variety of cuts in my rugs. I just use whatever I think fits a motif the best.....so the "Halloween" word at the top was hooked in a #9 cut, "is" is hooked in a #6 cut and "calling" is hooked in #8. The little swirls were #6, or maybe a #5. Sometimes I don't want to get up from my chair so I'll just hand-cut a little strip from those fuzzy-ended pieces you get when you tear the wool and cut it. 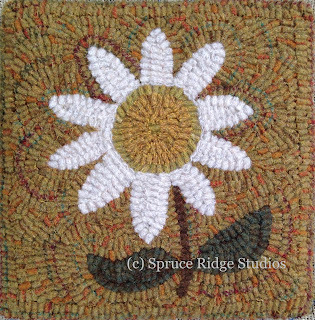 This rug still needs have the edges bound so for now, it is just pinned. One of my friends once told me that I was a professional pinner! Ha, ha! I say, whatever works at the time, go for it! The calendar tells me it's just 8 short days before we will be setting up our booth at the Michigan Fiber Festival in Allegan, Michigan. I enjoy vending at fiber festivals because I get to meet all kinds of people who are new to rug hooking....I feel like I'm spreading the joy! Our booth in Allegan is big enough that I can sit and hook, which usually creates a lot of interest! But before we arrive at a show, I often ask myself what is it that beginners are looking for, as far as kits are concerned. What type of design? What colors? How much will they spend? In the past, I have tried to provide low-cost kits that are attractive but I think I need to change it up a bit from year to year. I have to admit, I am not an avid kit maker. It's messy to cut up all that wool...especially when you are assembling 10 or 12 of them at a time. 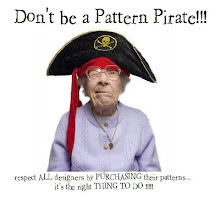 And yet, I know it's essential to provide a simple pattern, cut strips, and a beginner hook. I want everyone to love rug hooking just like I do! I got a wild hare the other day. Sometimes ideas pop in my head and just beg to come out. I felt like time was getting away from me but I pushed the pedal to the metal. I hooked up two new little samples for beginner kits and they will make their debut at Fiber Festival next week-end. They are both 8" square, easy to hook...and just darn cute! What more could a beginner ask for? I'll be posting them to my website once I'm back from Allegan. I've been hooking up a storm lately (and rewatching Downton Abbey), so I'll show you some of what's been on my frame in my next post. We are certainly feeling the Dog Days of Summer here in Michigan. 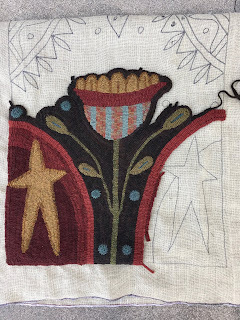 While I mostly like to talk about rug hooking and my fiber animals here on my blog, I thought that today I would tell you about something that has been our town's claim to fame for nearly 70 years. 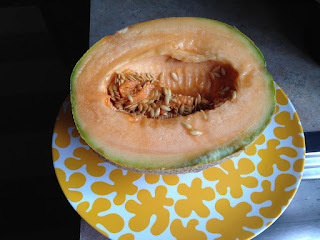 A Howell melon is a hybrid of a cantaloupe but honestly, there is no comparison, as I prefer the taste of a Howell melon. They are sweet, very juicy and melt in your mouth. For some reason, they are only grown around our region. There were only 3 big farms who grew them when I moved here in 1989. We have a Melon Festival, a Melon Queen, a Melon Parade, and yes, even Melon ice cream. This all takes place in mid-August, when the melons ripen. We tried growing Howell melons back in the 90's. The key word is "try." LOL. We did everything we were told to do: build a mound to plant the seeds and make sure it faced the south. We nurtured those poor little seedlings but in the end, we only got about 4 melons and 3 of them rotted on the vine. The fourth one never grew very big and it was pretty sad to look at. What happened? Well, melons like warm humid nights and hot summer days. It turns out that the year we tried to grow them was the coldest and worse summer on record for growing Howell melons. The farmers had a loss too. They brought in melons from Indiana so our Melon Festival won't be a failure and hoped for a better growing season the next year.